Good morning 🙂 How are you today? 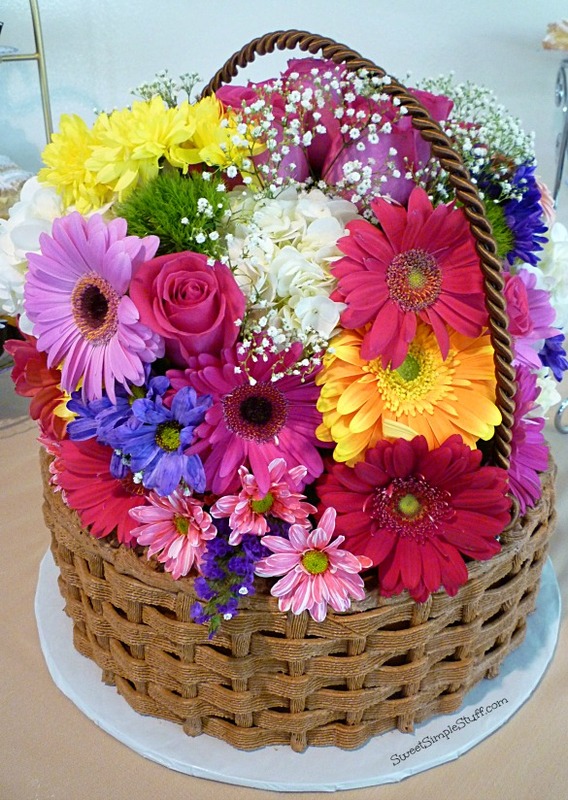 Ready for an Easter idea? Easter isn’t until April 20 … it felt so far away … now it’s less than a month! There are several foods that come to mind when I think of Easter … two of them being chocolate and eggs. Do you like crispy rice cereal in your chocolate and isn’t everything better on a stick? 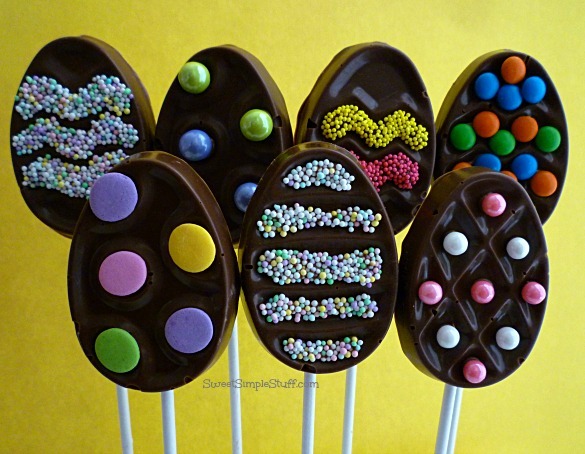 I hope you answered YES … because today I made Krispie Chocolate Egg Pops for you! I carried this Easter Egg Cookie Pan with me as I shopped the entire store … tried to talk myself out of buying it … didn’t listen to myself … found out it was on sale … sold! 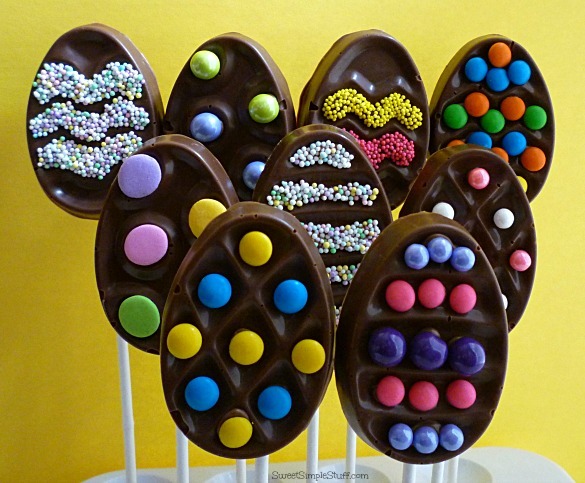 It went home with me and I knew that Krispie Chocolate Egg Pops would be my first Easter post for this year. 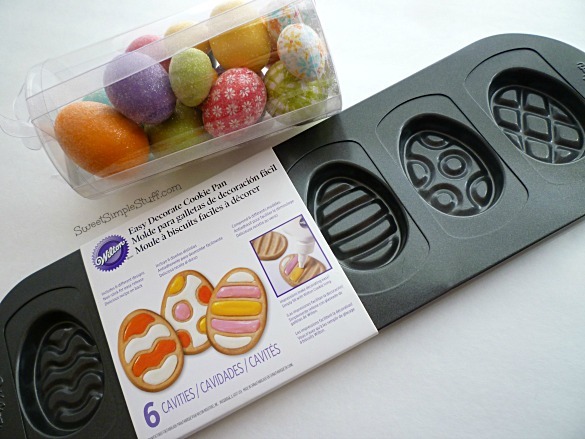 This is a great pan, but if you can’t find it … maybe you already have something in silicone or a candy mold. anything else you may like! Melt the chocolate according to the package directions. Set aside about 1/2 cup of melted candy to use later. 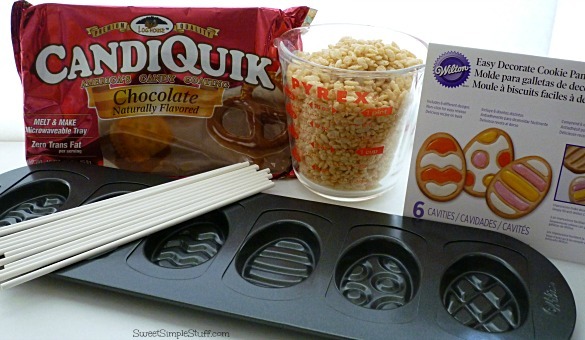 Mix remaining melted candy with the cereal … spoon into mold and tap pan on the counter to help release air bubbles. Insert stick into candy … rotate stick to cover with candy … chill for a few minutes. Note: make sure you have a clear space in your fridge and use caution when placing pan in the fridge, because the sticks move easily. The pops should come out of the pan easily … if they don’t … put back in the fridge for a few more minutes. Hint: If you like … use a toothpick and some melted candy to fill in the air bubbles … I wasn’t that ambitious … nobody complained as they scarfed down the pops … that’s just the way my guys are! I’m sharing some pops with the neighbor kids later today … wonder if they will notice? 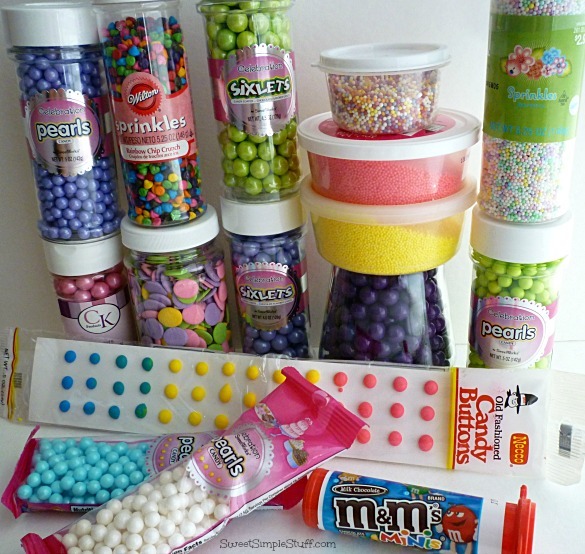 Use the melted candy that you set aside (I put it in a squeeze bottle, toothpicks work also) to attach candy decorations! I do have one word of caution … the sprinkles were a little messy … if you are letting the kids do this, they will need help! Thank you to Miss CandiQuick and SweetWorks for supplies! Thank you Beth 🙂 I love it when pans can be used in several ways … knew that I needed that pan! 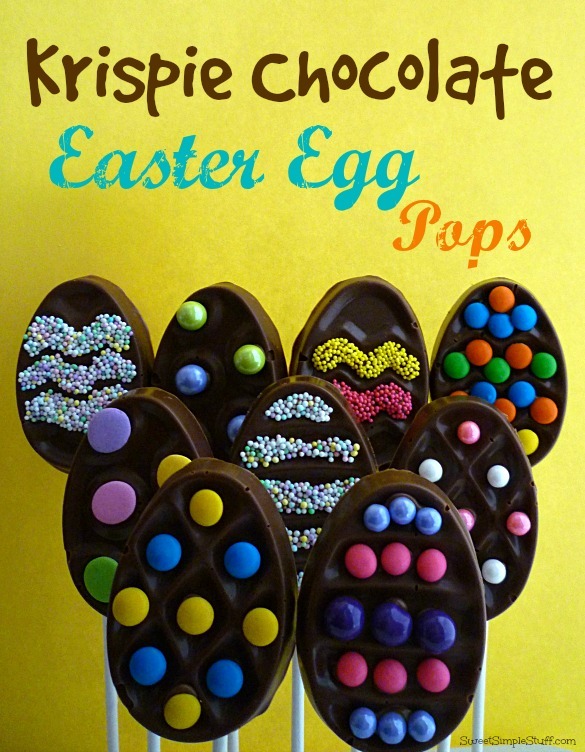 The Krispie Chocolate Egg Pops looks good & they sounds easy to make. I like how you Decorated them. And of course you know I have to share these. you went and done it now; showed me some cute little krispie pops and a awesome looking Wilton pan……………..I just gotta get me one now. My weakness is molded pans. Will be going into town today so hopefully Michaels will have the same pan. My 9 grandkids will love these. Thanks for the recipe. You’re the best, as you come up with the cutest and creative ideas. Have a fun and enjoyable day. Thank you Colleen 🙂 … and I apologize! I tried to talk myself out of another molded pan … didn’t listen to myself … again! Think of it this way … it’s for the kids … you probably have a coupon for Michael’s … the pan is very versatile … it’s flat and stores easily … do you feel better now? I want one of the egg pops right now, like for breakfast! Super cute! Thank you … those pops contain cereal 🙂 Enjoy your breakfast! Love that you tried to talk yourself out of buying the pan. 🙂 Love this simple idea. Thank you Kendra 😉 I am quite happy that I don’t listen to myself! Thank you Lisa 😉 I’m not so sure that I’m brilliant … just have learned to use things differently … like this pan … I may never use it for cookies … maybe brownies, next time! 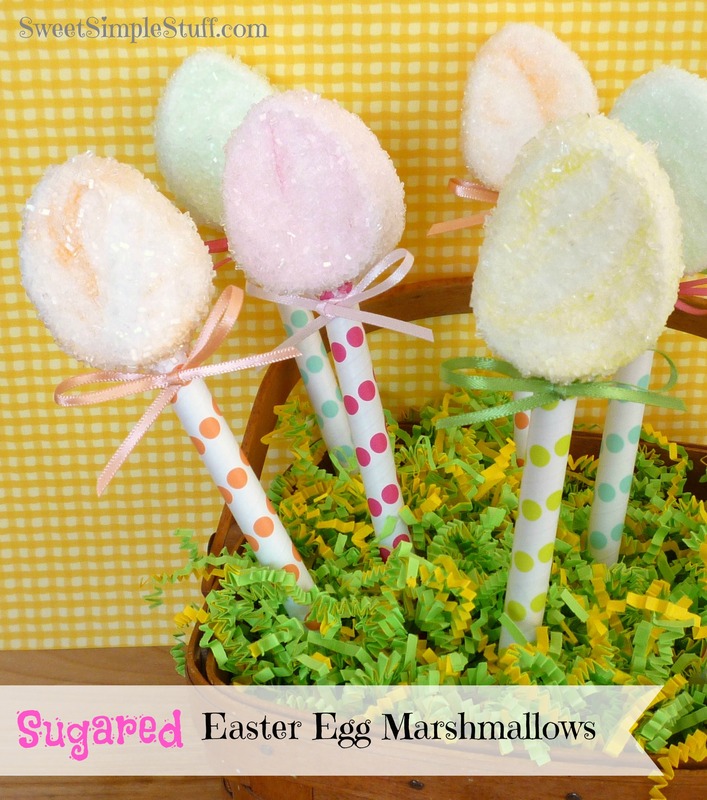 Looking for an Easter treat to make with the kids? 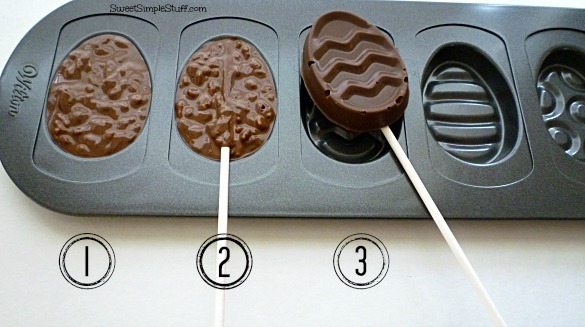 These chocolate pops are the perfect thing. When chocolate is involved everybody wins. 🙂 These are super cute and festive and definitely something the kids will enjoy making. This recipe comes from Sweet Simple Stuff. You’re welcome. Too cute not to share. Thanks Jocelyn 😉 Super easy … that’s how I roll! Thank you Emily ;). 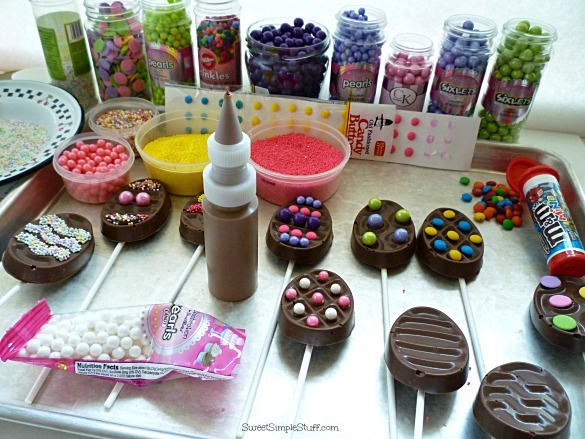 How about Rice Krispie Treat egg pops or white chocolate or cookie pops?